“The Phunkyfoods program has been absolutely fantastic this year. Our local PhunkyFoods Co-ordinator, Wendy Walsh, has delivered a number of informative assemblies and workshops to the whole school to promote healthy lunches and to deliver the message ‘Strive for Five’. 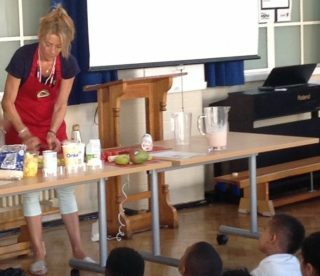 In the most recent assembly, Wendy demonstrated how to make fruit smoothies and some of the children had the opportunity to taste them. In addition, Wendy ran an Egyptian food tasting session on Ancient Egyptian Day and she provided ideas for recipes for the Year 4 Roman day. We have also appointed two Phunkyfood Ambassadors in the school who assisted Wendy in her most recent assembly. They have also delivered an assembly to promote the message ‘Strive for Five’ and their new message is ‘Drain your Drinks’, an initiative to stay hydrated every day.